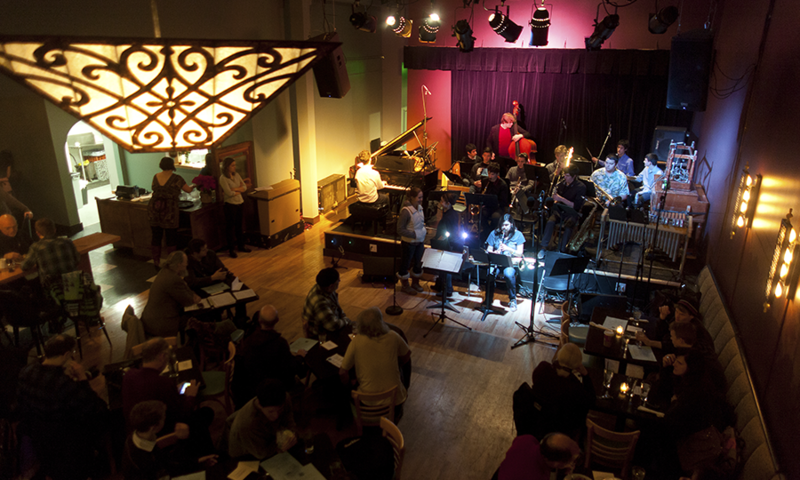 In 2009 musician and composer Wayne Horvitz approached longtime Seattle bar, restaurant and venue owners Tia Matthies and Steve Freeborn about partnering on a new project in Seattle. After two years of planning and development the Royal Room opened in historic Columbia City in December 2011. With permanent backline, recording and video, a grand piano and a generous stage, the venue has been designed to serve the musicians and artists who will be performing. The restaurant and bar has a comfortable neighborhood feel that welcomes patrons of all ages and varied tastes, from an after work happy hour to late in the evening. The music featured at the Royal Room covers a wide range of styles, with an emphasis on creative programming and development. This allows artists to work on projects in a collaborative community space. To that end, the club has been designed to accommodate in house recordings, off hour rehearsals and residencies of four to twelve weeks. The Royal Room was recently featured in Downbeat’s selection of Great Jazz Venues. Read the article here. The Royal Room is open seven nights a week at 5:00pm. Happy Hour Monday through Friday 5:00-6:30pm.